If you have a recent onset problem with your eyes such as those listed below, then this service may be able to assess and treat you. The service is funded by the NHS and is available from Patricia Hayselden and Partners, as well as other local opticians throughout Oxfordshire. Appointments are available within 48 hours (2 working days). NOTE: This Minor Eye Conditions service is for sudden onset problems and not for major, prolonged eye conditions such as cataracts, diabetic retinopathy or glaucoma. If you are registered with an Oxfordshire GP and over age 6, you can use the service. To make an appointment, call us on 01491 835466 or come into reception. You will be asked some questions about your symptoms in order to assess if you are suitable and how quickly you need to be seen by this MECS service, which will be within 5 working days or sooner if possible. 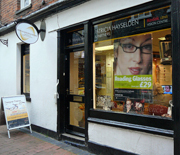 © 2012–2019 Patricia Hayselden & Partners, and daspace.co.uk. Please see our copyright notice.